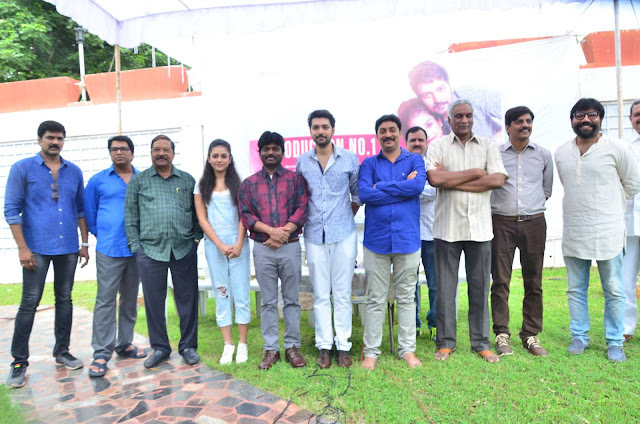 A new film starring Karthik Raju and Mishti Chakraborty in lead roles and bankrolled under Wings Movie Makers has been launched today in Annapurna Studios. M Purnanand is directing the movie while G Prathima is producing it. The event was attended by KS Rama Rao, Tammareddy Bharadwaja, Vizag Raju, Karunakaran, Dasaradh, MSN Surya, Sandeep Reddy, hero Karthik Raja, heroine Mishti Chakraborty, music director Siddharth, cinematographer Malhar Bhatt Joshi etc. A Karunakaran sounded clap for muhurat shot, wherein Dasaradh switched on the camera. Kranthi Madhav did honorary direction for the first sequence. Karthik Raju, Mishti Chakraborty, Nagineedu, Prithviraj and Gemini Suresh are the prominent cast. Music is by Siddharth, Camera is by Malhar Bhatt Joshi, dialogues are penned by Pradeep Aacharya, Poornanand M and art is by Ramakrishna. Producer for the film is Prathima and story, screenplay and direction are by Purnanand. M.